Why Do You Need a Customer Service Knowledge Base? Creating a customer service knowledge base can be a difficult task and it takes a lot of work to manage and maintain knowledge base articles. And on top of that, it takes time to create professionally written articles for the knowledge base that have a consistent tone, look and feel. And yet, implementing a knowledge base can have a positive effect on the quality and efficiency of your customer service as customers benefit from interactions with more knowledge support staff, who are themselves empowered to resolve issues with greater speed and consistency. However, implementing a successful customer service knowledge base program requires careful planning. In this post, we’ll share tips and customer service best practices to help you achieve exceptional results from your knowledge base implementation. Speed and knowledge both play a crucial role when it comes to customer satisfaction. Your customers don’t just want fast and accurate information. They demand it. In our recent customer service benchmark report, we found that the average response time is 12 hours and 10 minutes. And one of the best ways to deliver a timely and high quality service is to use a customer service knowledge base. Most customer service agents will have their own knowledge base in the form of a Word document or notepad file. And while this save them writing each response manually, the information might be inaccurate and outdated. Many businesses are overwhelmed by the idea of creating a new knowledge base and instead, choose to stick with their less efficient system. However, a good customer service knowledge base not only improves customer relationships but will also reduce the time new staff spends on training and help you cut down response times. Improved efficiency: Enforcing a knowledge base program with easy to use processes drives employee behavior to support and use the knowledge base database. Improved content quality and consistency: Focusing on improving the knowledge base quality will improve the content quality and information across multiple service channels. Increased customer trust and loyalty Providing consistent information across all channels builds trust from customers in the brand and company, which ultimately improves customer loyalty. Reduced resources and costs: A knowledge base can help customers resolve issues using self-service methods, which leads to reduced call and email volume. When combined, these operational improvements can have a positive effect – making it possible for organizations to optimize the customer experience. The main purpose of creating a knowledge base is to improve speed and quality through customer service. And the key to creating an effective customer service knowledge base is getting it right from the beginning. These 8 best practice tips will help you build a solid foundation for your knowledge base and that allows you to grow quickly and efficiently. 1. Know your audience: Knowledge base articles should be written and reviewed in the perspective of the reader. They should be well organized, short but sweet and written in a user-friendly tone. In most cases, you can use acronyms within your industry – For example, using the acronym “CRM” as oppose to writing customer relationship management. 2. Use templates to standardize articles: Make it easy for your customer service team to use professional answers by creating email templates. Templates are a great way to ensure that your knowledge base is consistent in language and tone across all departments and for all customer service agents. 3. Organize your content: While a search function provides an effective means for customer service agents to find helpful articles, it helps to organize your content so that agents can find what they’re looking for intuitively. The best way to do so is to create categories and sub- categories. For example, knowledge base articles that includes articles on “email response times”, “emails sent per user” and “emails pending” could be placed under Reporting > Email Reporting. 4. Admin & users: Use user roles to create permissions that restrict new customer service reps from publishing a knowledge base article into the live database. Not all knowledge base articles will be published and need to be checked for accuracy first. 5. Quality assurance: Before any new knowledge base article is added to the database, a quality checker should review all articles for accuracy and completeness. Ideally, this will be performed by a dedicated knowledge base manager. 6. Create and use Macros: A simple and effective way to streamline your customer service workflows is to create macros. Macros allow customer service requests to be answered with a single, standard response, which saves you the time and effort of creating a separate response to each customer that has the same issue. 7. Establish a reference system: All articles should be assigned a unique ID for quick reference. Abbreviations can be used for sections and categories (ie, CS for Customer Service) and numbers for individual documents (ie, 1 for User Guide). 8. Capture customer feedback: It’s great to have a knowledge base, but in order to understand how helpful the articles are, you need to capture feedback from your customers. An easy way to do this is to set up an auto-responder that asks if the response was helpful once a ticket or case has been closed. Once you start to collect feedback, you can quickly identify which articles are the most helpful to customers and which articles need improving. When creating a new knowledge base entry, customer service agents should first search the knowledge base to see if an article with a similar topic currently exists. If no article is found, then a new article should be created. If a similar article does exist, then the existing one should be updated by the customer service agent along with a note that includes why the article has been updated, and when. The tile of the knowledge base article should contain specific keywords that explain the content within the article so that when a member of your customer service team searchers for an existing answer, they find the most suitable article. For example, “Email response rate by day of week report” is better than “Email report #10”. While the primary goal of your knowledge base article is to help the customer, the content should be descriptive enough that both the customer and your colleagues find it useful. One way to do this is to think of your reader as someone who has never used your product or service before and make your article as descriptive and specific as possible. For example: To view the email reports, log in to your account at www.superoffice.com and visit My Account > Reporting > Email. By doing this, you are making the knowledge base article easy to find through multiple keywords and you’re helping the customer with their problem. The knowledge base will not hold every answer and at times, you may need to create a new template and suggest that it be added to the knowledge base. Before you submit any new articles, make sure you check your spelling. This is especially important when it comes to keywords and tagging of articles. If not, someone searching for the article “How to upgrade CRM solution?” might not find the specific article if it was incorrectly spelled “How to uprade CRM soluton”. Even though your knowledge base article is descriptive, it still not might solve a problem. When attaching screenshots, make sure the image you use is up to date. There’s no better way to confuse your colleagues and customers by including an outdated screenshot or video. Each knowledge base article should link to helpful resources found on your website – Whether that’s linking to a frequently asked questions section or video tutorial section. By linking to helpful resources, your colleagues and customers are able to find related content to help them with any further issues they might have. There’s nothing worse than trying to read through an article with poor formatting and block text. 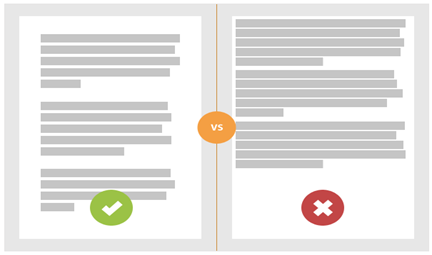 Careful formatting such as using bullet points when providing specific instructions or using a color to highlight important information makes your article easier to read for your customer service team and your customers. Using a knowledge base for customer service is a great start but once you have a knowledge base up and running and deliver a better service, you can start to use your knowledge base to create an even better customer experience. Here’s three ways to improve your customer service using your knowledge base platform. When a customer sends in a support request, the auto-responder reply has both a confirmation that the email has been received and a unique ID. Once you have collected enough data on your most frequently used knowledge base templates, you can update your auto-responder to include your most frequently asked questions and answers. For example, if you have scheduled a maintenance update to occur on a specific date, you can update your auto-responder to include this information during your downtime so that customers who may have missed the announcement and have sent an email to your customer service team are informed. Using the reporting feature in your knowledge base tool, you can extract the most commonly used articles and add the content to your website and create an FAQ section. For example, each month you can pull a report for the ten most frequently used articles and create the questions and include the answers in the FAQ section on your website. As your knowledge base evolves and grows, you will find that much of the content can be placed on the website in order to allow customers to find the answers to their questions themselves. You can either upload the content manually or, if the knowledge base tool can integrate automatically, you can have a living, breathing customer service content bank that answers the majority of customer service questions all without having to respond to common questions. A study by Pew Research Center, 59% of online adults use search engines to find information on the web during a typical work day, so not only will this cut down on your customer support queries, but this kind of content is great for generating new website traffic. As the customer continues to take the center stage of any business, a knowledge base is an effective way for any business to focus on improving the customer experience. And while this usually comes with additional resources through marketing and new software, a knowledge base will help you achieve higher levels of customer satisfaction and improve customer service quality and loyalty, while at the same time reduce costs. Use the tips and best practices discussed in this post to create a world class customer service knowledge base platform and deliver a better customer service experience. What do you think of the customer service knowledge base tips? P.S. Get your customer service knowledge up and running quickly by downloading seven free customer service templates. I think, customer service knowledge base provides right and proper information when they want it. Nowadays, customers don't wait for the information, they use 'Google' and get it what they expect. Knowledge base (effective) provides the same immediate information to the customers what they are looking for. so you can say, a knowledge base is an effective way for the customer experience. That's exactly right. Thanks for commenting, Charles! Using a suitable web based knowledge base properly can improve your the productivity of your customer service in many ways.